Dreadtober is nigh upon us! 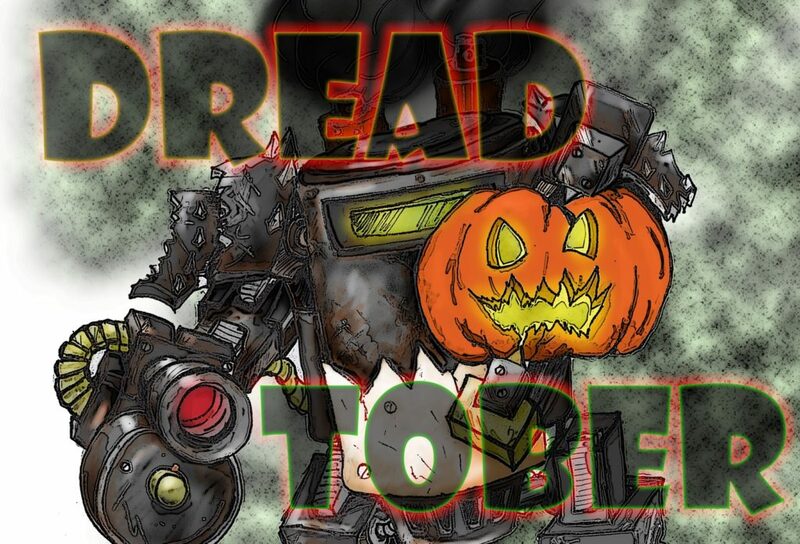 September is almost over, and soon many of us will be participating in this potential juggernought of an event, Dreadtober! This year hosted by Joe over at Broken paintbrush, this will be a killa of a month with a tide of fiendish mini-challenges defftly sprinkled throughout; working through the knight to get the job done, hopefully I won't keel over from the strain-- and the THRICE-DAMNED PUNS-- why have I resorted to puns? To-day, all pathetic jokes aside, I'd like to declare my intentions for next month; I'm going to scratchbuild a loyalist SM dreadnought. Well, maybe not build from scratch; I've got a few bits and I'll be bridging the gaps with plasticard. Does that count as scratchbuilding...? Never mind, I'm sure nothing will go wrong. With Alone with a Dream watching over me, I will succeed in the Emperor's name! It's not much, I know... So, working with what I collected so far, I made a sketch of what I intend to achieve. This will be bigger than the ordinary dread, big enough for two brothers interred-- twins who tried to take each other's lives and now fight together for eternity. More weapons, Split Fire and Power of the Machine spirit would doubtless be in order here. So that's that! In the meanwhile I'll try to find time to finish some of my other projects to show you. My skitarii are now feeling VERY left out and with half a knight on my desk it's getting hard to focus on one model at a time... Oh well! Kitbashing Alone with a Dream# 2: It is done! At last! At last I've finished him! For part one of this epic project-- and a picture of what Sergeant Alone used to look like-- please click here. We'll get to the finished product in time, please be patient. Last I left off, I hadn't trimmed the edging around Alone's thighs; not a good place to end on, but that got fixed pretty quickly. Now it was time to add detail. I like detail. Piping, purity seals and drug injectors; I also swapped a knee-plate for the wings from the Templar's dreadnought front. The chainsword got a bit of attention too. The wings were next: Funny thing, I ordered a box of DE scourges and waited patiently for a week before realising I still had spare wings in the bottom of my bitz box... Oh well. It pained me to chop his wings up-- I felt like the horrid Warmaster, but I had to, it's part of his backstory: he fell through a planet's atmosphere and hit the ground ten times the sped of a drop pod. He never set them straight after they shattered. I don't really like the whole tidy, one-either-shoulder wing setup, I like to have them erupting from the Astartes' back like a psychic manifestation. Structure goes out the window, and who cares? It looks cool. Straight into painting then! Not much to say here, except that it was far too exciting. I tried to shade between his legs so the eye didn't tend to go down there. Oh yes, I undercoated first. Pretty soon-- as in several hours of nonstop work, good job it's the weekend-- all I had to do was wait for the iffy sealant to dry on his wings and photo time! I will repeat the fact that I wanted to try to copy the pose ofFW's Corax; hopefully it doesn't detract too badly from the project. I liked the unprecedented grace in the pose, and I think replacing the pistol hand with an open palm adds to it, almost as if he's chucking the daemon prince under the chin before taking its awful head off. I'm afraid you can't really see here, but the other, plainer side of the chainsword I filled in with cheques and hazard stripes. And finally against the Betrayer. I think this might have been the duel which ended his life. Background image is a piece by Zdzisław Beksiński. So that's that! How exciting, I've finally finished sergeant Alone with a Dream! My blog's mascot character and as much a poster boy Astartes as the Sagodur Fjorlag will have. Hopefully I've done the character justice this time around. Thank you for reading! Bye bye for now. 10 minutes before my appointment I rushed into the local games shop and began scrabbling through the shelves-- Khornate, anything Khornate would do-! But Throne, the sculpt is amazing! I'm no authority, but I think they've brought him up to date very well indeed, pigtails and all. He's a lot better proportioned, for one. The simplest of bases would suffice; sand and a bit of grit and jagged stones. The only kitbashing I allowed myself was replacing the chains on his wrist with normal microchain. Props to GW for sculpting plastic chain, but this is so much thinner and tidier than what he did have; also I wanted to turn the chain into a bit of a decoration on the base. The first step was to paint Khârn in his original World Eaters scheme, and for how cruddy a job it was, he did look pretty cool. Dryad bark for where the brass would go after a few more layers, and black for the silver. So then I opened the pot of blood-- by now it smelled a bit rank, but oh well. The first few coats went on, and Khârn's transformation began... I left him by the window to dry off in the wind. Much better. The red was more crimson than pink now. Now was the time to put the rest of the colour on. Pretty soon all that was left was to take him out into the daylight to photograph him... the colour I had achieved actually terrified me. What have I done? What? Throne help me, I cannot appear before the Emperor's face the same way I used to... Bye bye for now. Assault brother Alone with a Dream, Eyreling of promise and forsaken under the Doom Chair. Seeing his flagellant's state, one would hardly know that once, in another life it seems, he was a veteran sergeant of the Sagodjur Fjorlag's 4th company Himinfjord, seconded to the halvard of the elite 1st after a mere half-century of service. Fate brought his ruin when a librarian's miscast gate of infinity swallowed him up and sent him fifty years into the past to the paradise world of Acropolis Quartus, a world of what he called "space pixies" over whom the corrupting hand of Slaanesh was slowly gaining mastery. Instead of liberating the world from the xenos as was only his duty, Alone sided with those uncorrupt and fought with the daemonic creatures for five years; the uncorrupted pixies worshipped him as a god and one even proclaimed her undivided love and devotion for him, unaware that all emotion is wasted upon an Astartes. Alone with a Dream chooses to wear as little plate as necessary; the concern behind this self-flagellation being a shadow of taint, though he calls it punishment. After his muscle tone had adjusted to the intense gravity of Acropolis, no suit would fit him now anyway. His triad of wings, while misshapen from breaking through that planet's atmosphere, can still carry him, just-- and he refuses to have them seen to or amputated in place of a jump pack. As a result of his accident, he refuses to fight alongside psykers and has developed a maddened fervour in their eradication, traveling the stars to seek teachings from the epitome of all witch hunters-- and the Sagdjur Fjorlag's legendary brethren-- the Black Templars. While I suppose it wasn't too disgusting, I'm embarrassed by it now. Also he only has two wings-- Throne, what was I thinking-!? By-the-by, the turn that White Dwarf has taken looks pretty nice. First of all I had a go at drawing what I generally wanted him to look like. I like the whole incomplete power armour look, it's quite gladiator-ish and something more loyalists should be doing; maybe not without the codpiece, though. I was going to start with a WoC charioteer body like my 3rd chaplain, but this kit would be much, much more exciting to start with! Also the finished figure would be taller and broader than an ordinary Astartes, even the WoC bodies I use almost exclusively now. A BA head worked quite nicely after the jaw was cut down a bit, greenstuff hair and a pointy ear because I like pointy ears. The other ear is a vox feed from a normal helmet. I'm copying the pose of FW's Corax. The tilt of the torso seemed to lend itself well. But now the whole size issue posed a bit of a concern about legs. At this size, not even terminator legs would work, and stormcast eternal legs, while okay, were too leg-shaped. A bit of reposing was in order. There's the start of his chainsword too, alongside a normal one for comparison. I began building up around the calves to make them more blocky before giving up and putting the two halves together. I couldn't bear to see him in two bits! Not sure if you realise, but with Astartes power armour, the legs are separate pieces and the soft armour at the hips only covers the space in-between; this means one can potentially wear them by themselves. Continuing to build up around the calves. They're looking a lot better now. Also I hollowed out the ribbing around the armpit to sculpt his normal one instead. Here's where I'm up to at the moment. The edging will be trimmed, I assure you! I put a lot on so I can clean it up after it sets, that's not what it's going to end up like! So that's that! So much greenstuff! Maybe if I finish the blog's flagship character, all my other projects will begin to get finished more efficiently...? We shall see.